WOMEN. MEN. CHILDREN. DOGS. CATS. BEARS. CARS. SHOES. 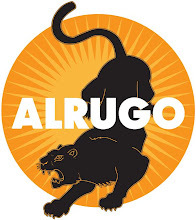 Be aware, be very aware; The Alrugo News Feed and Production Log has officially come into being, like so many tiny quantum particles bursting unexpectedly into the fabric of our universe! Do you want to know what's going on at Camp Alrugo? Do you want to peer into our world like some perverted owl watching a teenage girl undress? Is the ability to manually hunt and devour all of the information you may desire at the press of a few buttons just too damned much hard work for you? Labor no longer, lazy girlyboy! The Mantis' Quill is here to provide you with the freshest, tenderest, wildest Alrugo-meat that you can sink your teeth into. You will find yourself returning repeatedly just to see if one more new release Alrugo Film, one more Alrugo Poster, one more Alrugo Song or one more stunning insight into the film/orange juice-making world has been thurst upon this interwebses for your enlightening pleasure.